Sous Sdei and welcome to Siem Reap, Cambodia! Siem Reap is the gateway to the ancient and magnificent Temples of Angkor. From the 9th to the 13th centuries Siem Reap was the capital of the powerful Khmer Empire which left the legacy of the Angkor Temples. You will be met by an Evergreen Cruises & Tours representative and transferred to your hotel. This evening join your Tour Director and fellow travellers for a welcome dinner. Start the day at the magnificent and famous Angkor Wat. The temple is known for its elaborate decorations and intricate carvings throughout. It is a masterpiece to behold and will leave you breathless. Continue to the unique Ta Prohm temple which is overgrown by jungle trees. In the afternoon, visit Angkor Thom through the ancient South Gate which is lined with carvings. Continue to the impressive Bayon Temple, containing 54 towers each with four faces. Finish at the Terrace of the Elephants and the Terrace of the Leper King known for their intricate bas-reliefs. You’re Invited: This evening witness the incredible Phare Cambodian Circus. Phare is an NGO founded by Cambodian refugees to assist disadvantaged young people by teaching them performing arts. The show is a spectacle of acrobatics, theatre and music themed around contemporary Cambodian life and society. Make our way to Wat Hanchey, an ancient hilltop pagoda which is the home to Buddhist Monks and offers some of the best views of the Mekong River. You’re Invited: Receive a traditional Buddhist Water Blessing from the monastery’s resident monks. After enjoying a walk around the monastery and the amazing views of the Mekong River valley, we descend the enormous stairway, surrounded by the incredible view of the Mekong below. 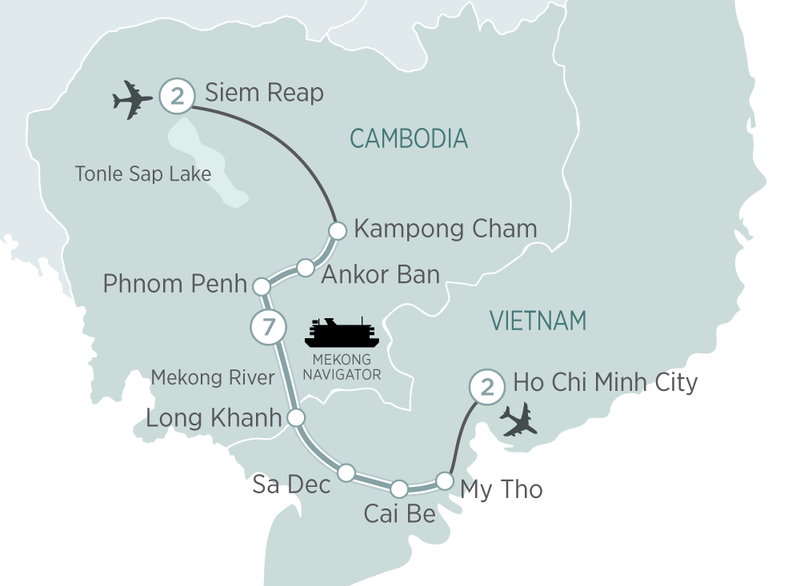 Following lunch, we sail to Kampong Cham and drive through the city to visit the hills of Phnom Pros (man hill) and Phnom Srei (woman hill), the incredible Stupa, the 10-metre long reclining Buddha, and the 13-metre tall preaching Buddha. We then visit the 12th century, Angkorian-period complex of Wat Nokor Bachey, which features several original statues of Buddha and stone inscriptions. Cambodia’s capital Phnom Penh was once known as the “Pearl of Asia”, but it was almost entirely evacuated by the Khmer Rouge in 1975. Today it is an inspiring and buzzing centre of hope and opportunity with plenty to see and do. You’re Invited: After breakfast, we meet our cyclo drivers for an exciting morning city tour of Phnom Penh. Cyclos, a Phnom Penh institution are three wheeled bicycles built for transporting passengers. They are a traditional mode of transport throughout the Mekong and provide a unique view of the capital. Prepare for a leisurely journey as we are taken along the riverfront to the magnificent Royal Palace complex which is a highlight of any visit to Phnom Penh. Enjoy a leisurely walk through the grounds, viewing Throne Hall and Moonlight Pavilion before visiting the famous Silver Pagoda, home of Cambodia’s Emerald Buddha and Maitreya Buddha, encrusted with more than 9,000 diamonds. The cyclos then transport us to the National Museum, ending the morning with a comprehensive tour of the many Angkorian and pre-Angkorian artifacts discovered in the Angkor Archeological Area in Siem Reap. Our afternoon is again at leisure. You’re Invited: Before dinner, visit the Sun Deck to enjoy a cultural performance by the Cambodian Children’s Group. The performance includes Apsara, Cambodia’s national dance as well as local traditional folk dances. You’re Invited: Travel to the infamous Cu Chi Tunnels. An ingenious network of over 200km of underground tunnels, they were built by the Viet Cong guerrillas as a means of protection, communication and deception. Join a Vietnamese Veteran and learn of the wars, strategies, atrocities and the resourcefulness of the Vietnamese which eventually led to the defeat of their enemies. Hear fascinating stories from first-hand experience to allow a real insight into one of the most famous wars of our time. Return to Saigon and spend the afternoon exploring the city. This evening enjoy a sumptuous farewell banquet. Transfer to Ho Chi Minh City airport for your onward flight. We hope you enjoyed your Evergreen Cruises & Tours tour and cruise of South East Asia and hope to see you again soon!